Will Fannie Mae Reconsider Southwest for its HQ? (1) Waterfront Station: There are still two vacant parcels along M Street on either side of 4th Street that are slated for office. The SE parcel is right on top of the Waterfront metro station and both buildings have plans for ground floor retail. Waterfront Associates won’t start construction on either of those parcels until it secures an anchor tenant. Since Fannie Mae was already planning to move to Waterfront Station at one point, this location probably has a leg up on the competition. 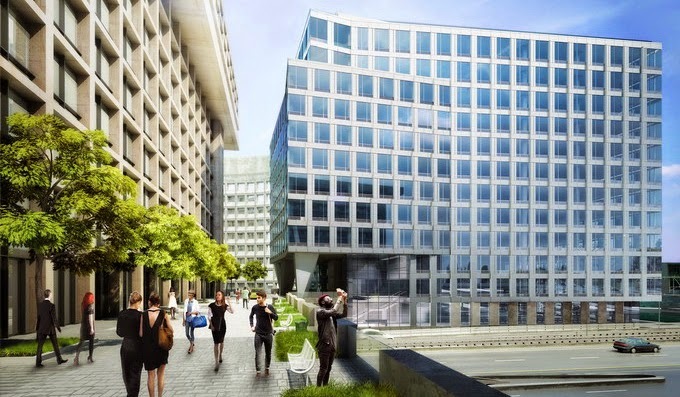 (2) The Wharf: Alternatively, Fannie Mae could opt for office space at The Wharf, which started construction in March and won’t be complete until 2017. There is an office building planned in Phase One of construction (Parcel 3A) facing Maine Avenue and a second building could be built closer to the Maine Avenue Fish Market (Parcel 1) if Hoffman-Madison Waterfront found a tenant. The Graduate School USA was originally going to occupy the Parcel 3A building, but backed out of the deal a couple years ago. The Wharf was a contender for The Washington Post, but ultimately the media company decided to move only a few blocks east from its current headquarters building downtown. (3) The Portals: Republic Properties has an empty parcel at The Portals that is next to the Mandarin Oriental Hotel on the 1200 block of Maryland Avenue. In addition to the hotel, there are three office buildings that have already been completed at the complex. 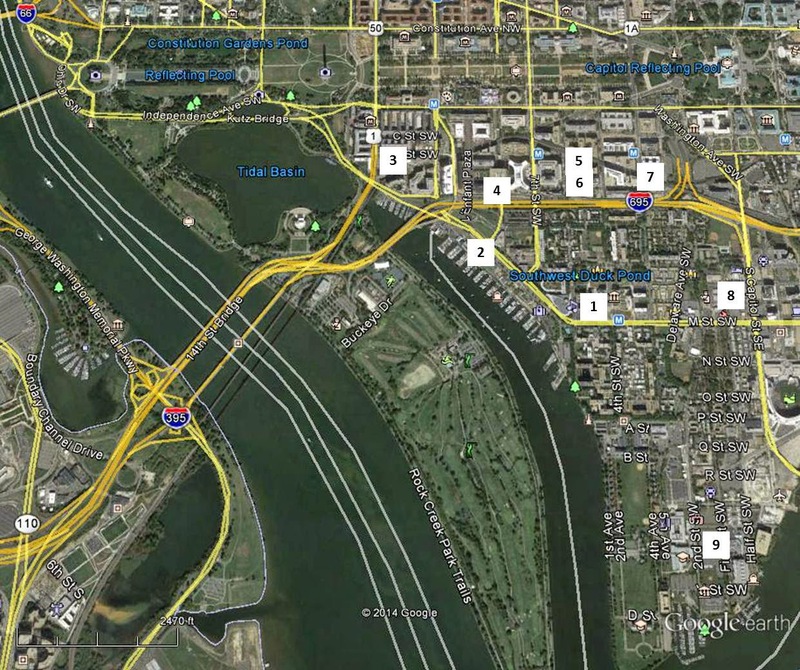 A Portals address would give Fannie Mae execs sweeping views of the Tidal Basin and high visibility from the traffic that comes into the city daily on the 14th Street Bridge. 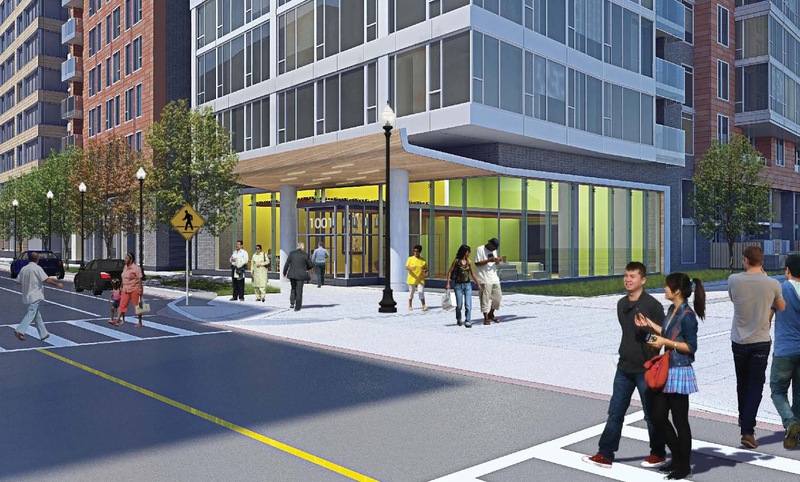 (4) L’Enfant Plaza: The JBG Companies has plans to build a 220,000 SF, LEED-Gold office building at 500 L’Enfant Plaza that will offer direct access to the L’Enfant Plaza Metro station and connect to the retail area that was recently upgraded. 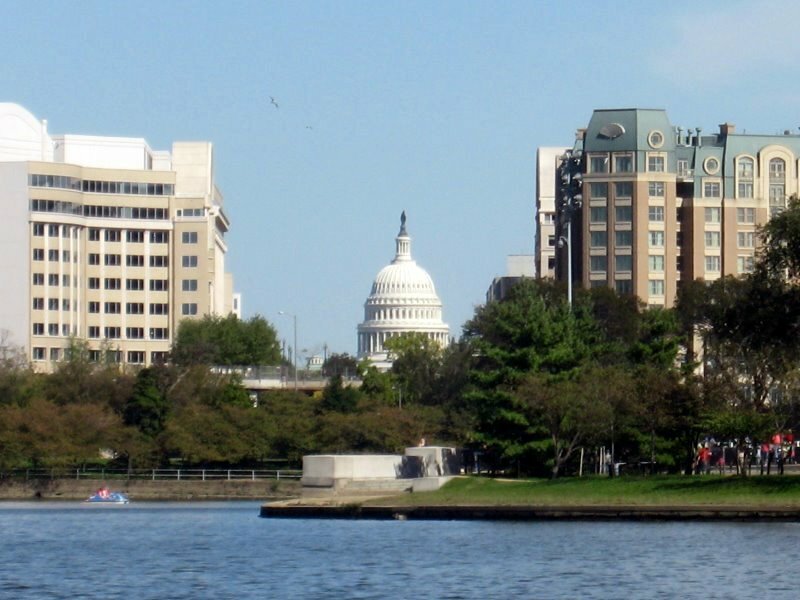 The building would be south of the under-renovation L’Enfant Plaza Hotel, adjacent to the 9th Street tunnel. 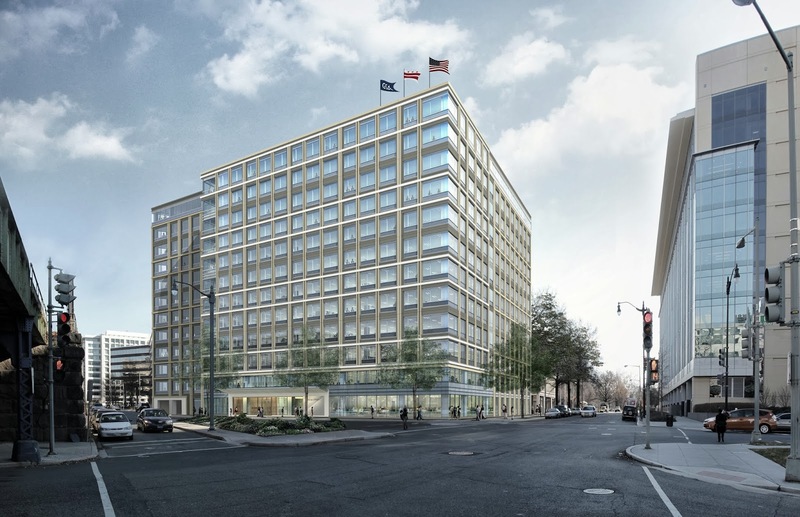 (5) 400 6th Street: Trammell Crow is currently building a 12-story, 342,000 SF office building at 400 6th Street, located across the street from Constitution Center and one of the entrances to the L’Enfant Plaza Metro station. If Fannie Mae moved here, it would be near other financial-related tenants including the Federal Housing Finance Agency and the Office of the Comptroller of the Currency; however, the site is not as prominent as some of the other options in Southwest. Over the past week, site work has been underway to transform the District-owned NE parcel at Waterfront Station into Nonuments Park, designed by Lance Fung and part of the 5x5 Project. The gravel pathway has been torn up and a more “permanent-looking” design is being built. On Saturday, volunteers gathered at the site for the Mud Dance, an event to create seating out of cob for the park. Photos from the Mud Dance are available here. Strong policy and advocacy background having worked on the Hill as well as in both private and non-profit health policy sectors. Principal of Zhende Strategies, a health policy consulting practice, after having served as Senior Director of the Cancer Policy Institute at Cancer Support Community, and before that was Senior Policy Advisor and Counsel for Health care, Judiciary, Education, Immigration and Government Affairs while working for Sen. Jon Tester of Montana. The garden will be created this week by artist Jennifer Wen Ma in the likeness of Lillstrom and the opening reception for Nonuments Park will be on September 6 from 11am to 1pm. Construction took a little more than seven weeks to complete; however, the playground was a long time coming. Back in 2010, a group of parents came up with the idea to build a centrally-located playground in the neighborhood since there was a dearth of play space for young children at the time in Southwest. With other members of the community joining the parents’ group, the SWPP was born. The group eventually settled on building the playground at the park located at 3rd and I streets, adjacent to the Southwest branch library. This location was chosen because of the synergy that could be created between the library and the playground. In addition, the park is located between public housing and middle class housing, and could serve as a bridge between the two areas where neighbors can interact. The SWPP first tried working with Kaboom!, a non-profit organization that builds playgrounds across the country. Due to technical issues with working with the Department of Parks and Recreation, the SWPP did not move forward with Kaboom! and instead tried to work with Make Kids Smile, Inc., a local non-profit. The playground equipment used by Make Kids Smile, Inc. was not compatible with the Gametime equipment preferred by SWPP, so the group ended up working directly with DPR and the Department of General Services to hire a contractor to install the play equipment. The selected play equipment is suited primarily for kids ages 2-5 and has a nature theme, including swings, a slide, spinning leafs, mushroom-shaped stepping stones, and climbing bars in the shape of a butterfly. The park prior to construction. In 2011, the SWPP hosted a “Draw Your Playground” design competition with students at Amidon-Bowen Elementary, which is about one block away from the 3rd & I Street Park. The students were able to show through their drawings that they wanted features such as swings, slides, a bike rack, and a water fountain at the playground. First place went to Edugwu Agada, second place to Jostin Garcia and third to Vanquisha Smith. In addition, a series of charrettes were held in the community to gather further input on the design of the playground. The original intent was to have a Community Build Day, but the city decided to have a contractor build the playground instead for liability reasons. An initial budget of $50,000 for playground equipment ballooned to $720,000 once it was discovered that significant infrastructure improvements were needed at the 3rd and I Street Park, including grading, utilities, and drainage. Not to mention the need to hire an architect. The SWPP raised over $100,000 on its own through donations from individuals and local businesses, but the infrastructure improvements necessitated city assistance. After some lobbying, $350,000 was secured in the District’s budget to close the funding gap and allow phase one to be built. Phase one included pruning and removing dead or dying trees in the park, as well as grading the site; retaining walls along the center berm area; fencing along I Street, SW and portions of 3rd Street and Wesley Place; playground equipment and soft surfacing were installed in the center berm area; and utilities work. A second phase will cost $270,000 and is still unfunded. The second phase will include storm water retention; more retaining walls; and repaving and scoring of the sidewalks. Two other playgrounds in the neighborhood are supposed to be upgraded later this year as a part of the Play DC Playground Improvement Initiative, including ones at King-Greenleaf Recreation Center and Randall Community Center. A ribbon-cutting ceremony will be announced soon for the 3rd & I Street Park. Glazing was removed, windows re-spaced, balconies shifted and roof structure materials changed from “high pressure laminate panel” to more durable horizontal wood plank. Also, a rooftop tree grove consisting of six trees has been added to the pool deck and the ground floor now includes a large lounge, dining and "hearth" rooms. This will be the fifth of eight buildings to be built or renovated at Waterfront Station. So far, two office buildings fully leased to District agencies have been built with ground floor retail and the two former EPA headquarters buildings have been transformed into Sky House apartments. The NW parcel building is scheduled to deliver in the second half of 2016. On Saturday, August 23 from 12pm – 10pm, Washington Project for the Arts (WPA) will host Mud Dance, a free event which will allow the community to help make seating for the Lance Fung-designed Nonuments temporary park, to be built at Waterfront Station on the District-owned NE parcel on 4th Street (and possible location of a new SW branch library) as a part of the 5 x 5 public art project. Nonuments is described as “a temporary sculpture park featuring ‘monuments’ devoted not to the great but to ordinary people, to the ideals of democracy, and to the common struggles of humanity.” The benches will be constructed out of cob (a mixture of mud, straw, and recycled materials) and involves stomping on the mixture, hence the name Mud Dance. WPA asks that Mud Dance participants wear comfortable shoes and clothes that can get muddy. All ages are welcome to attend and there will be music. Food will be served at 12pm and 6pm between cob-making sessions. The rain date for both events will be on Sunday, August 24. Nonuments will be on display this fall and the opening reception will take place at Nonuments Park on September 6 from 11am to 1pm. Check out 5 x 5 for more information on events surrounding Nonuments, Ceremonies of Dark Men at Arena Stage, and other 5 x 5 projects throughout the city. 5 x 5 is a project of the DC Commission on the Arts and Humanities. Trailers have been set up on the abandoned tennis courts, located at 7th and I streets at Jefferson Academy to accommodate classrooms for AppleTree Early Learning Public Charter School and utility work is underway. It was reported back in April that the charter school would have to close its two Southwest campuses at Amidon-Bowen and Riverside Baptist Church. AppleTree was looking for a temporary home until their new space is ready at The Wharf in 2017, so ANC 6D commissioner Stacy Cloyd wrote a resolution that was unanimously approved to urge the District government to allow the charter school to place a temporary trailer on the abandoned tennis courts at Jefferson Academy, located across the street from Riverside. A complication in the idea to put trailers in the tennis courts is that Jefferson Academy is scheduled to begin a modernization program in 2016, so Principal Natalie Gordon’s support for allowing the trailers there was conditioned that their presence not interfere with, or delay for any reason, the planned modernization of Jefferson. Some restoration work was recently done to the cupola of Jefferson, which is now illuminated at night and more work will be done on the campus starting in 2016. 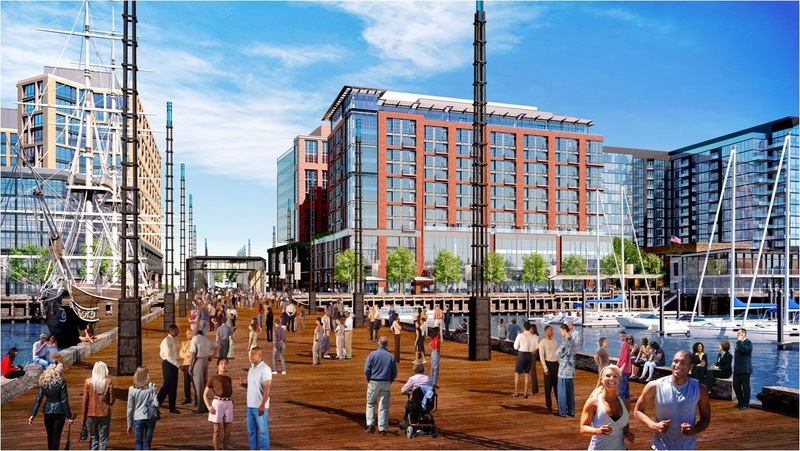 Over the past few weeks, demolition has moved along the Southwest Waterfront to make way for The Wharf development, claiming Zanzibar and 7th Street Landing in the process. This area of Water Street looks a lot different now than it did a few months ago. In addition, a raze permit was recently issued for the former Phillips Flagship restaurant over at 900 Water Street. View of dock construction from East Potomac Park. Construction of the docks for the Capitol Yacht Club is underway now that pilings have been installed in the Washington Channel with completion scheduled for sometime in October. Once the Capitol Yacht Club docks are completed, work will begin on District Pier, which will extend from 9th Street out into the channel. St. Augustine's Church closed in June. Meanwhile, demolition is scheduled to begin at St. Augustine’s Church in September. According to the Washington Business Journal, PN Hoffman has awarded the construction contract for the condos planned there to Balfour Beatty. The address of the condo building was first reported as 600 Water Street, but now, it appears that the address has changed to 625 Water Street. Completion of the 108-unit building is anticipated for the beginning of 2016 with sales to begin in 2015. Update: The WBJ now reports that prices for the condos will "start out at around $400,000 and move on up to $1 million or more." I got a chance to tour Sky House East apartments at 1150 4th Street in Waterfront Station again last week. During my last visit in November, the common areas were still under construction, but now the building is complete and more than 90% leased. There are 213 market-rate units in the building (and 53 affordable dwelling units) and has the current distinction of being the tallest residential building in Southwest. Both Sky House buildings were formerly the headquarters of the EPA and were clad in concrete before their transformation to residential was started by Urban-Atlantic and The JBG Companies. Now that both buildings have been re-skinned with glass and metal panels designed by Wiencek & Associates, any remnants of the old Waterside Mall are all but gone. Below are photos of some of the common areas at Sky House East. Sky House West is the sister building to Sky House East and should start leasing soon. From what I heard, the rents in that building will be higher than the east building. Aerial view of proposed site of new SW branch library, looking north. Current library site is controlled by DC government, so any redevelopment there will include input from ANC6D and the community. Preliminary sketch of new SW library on 4th Street. A conceptual plan by CORE Architects for a semi-detached library on 4th Street would be a 21,400 SF space on two levels with 8,500 SF on the ground level and 12,900 SF on the second level. The main entrance would be on 4th Street, but most of the library frontage would be facing the tree-lined pathway on the north side of the property. The conceptual plan flips the massing of the NE parcel building as it was approved in the stage one PUD so the building opens up to the north instead of opening to the south like the planned residential building across 4th Street at the Waterfront Associates-owned NW parcel. Preliminary sketch of redeveloped library site at 900 Wesley Pl. The number of meeting rooms in a new library would increase to 5 or 6 of varying size and the number of hardwired computers would double. In addition to the library, there would be 17,000 SF of retail – 10,000 SF of which would be located on 4th Street. The remaining commercial space would be located on Wesley Place. Above the retail and library would be an 11-story, 346-unit apartment building with a portion of the units set aside as affordable dwelling units. There would be 29 garage spaces reserved for the library, 87 spaces for the residential units, 14 spaces for retail, and four spaces for professional office space. On the parcel currently occupied by the library, there is a conceptual plan for a six-story residential building with 80 units and about 7,700 SF of ground floor space that could have a daycare center.